In the pharmacy realm, not taking prescribed medications, or not taking them correctly, is known as non-adherence. 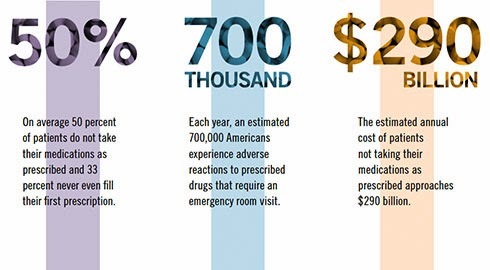 Unfortunately, a new study commissioned by the National Community Pharmacists Association (NCPA), titled “Medication in America: A National Report Card,” uncovered some troubling levels of non-adherence among some of the most frequent medication users in the United States. The research, conducted by Langer Research Associates, found that Americans 40 and older with a chronic medical condition requiring prescription medication receive on average a C+ when it comes to taking their medications correctly. Additionally, one in seven adults who meet the same criteria—approximately 10 million people—receive an F.
The grades were based on an average of answers to questions on nine non-adherent behaviors: whether or not in the past 12 months patients failed to fill a prescription; neglected to have a prescription refilled; missed a dose; took a lower dose than prescribed; took a higher dose than prescribed; stopped a prescription early; took an old medication for a new problem without consulting a doctor; took someone else's medicine; or forgot whether they'd taken a medication. These findings show that there are opportunities for prescription drug plans and policymakers to increase the nation’s overall adherence grade. On a federal level, NCPA urges Congress to pass the Medication Therapy Management Empowerment Act (S. 557 in the U.S. Senate and H.R. 1024 in the U.S. House of Representatives) to expand medication therapy management (MTM) services to Medicare Part D beneficiaries. This would not cost the government a dime; previous MTM programs have been shown to lower overall costs as increased pharmacist engagement with patients has avoided costlier health care treatments and procedures. Additionally, plan sponsors should examine their plan designs to ensure they are supporting activities that promote strong adherence such as allowing patients to choose a pharmacy that best suits their individual needs and allowing refill synchronization, which enables patients to have all of their medications refilled on the same day each month. Both of these activities facilitate a stronger patient-pharmacist relationship and promote safer medication use. There is a vested interest for all to increase adherence rates in patients, and enacting the aforementioned changes will help to reach that goal. By implementing common-sense reforms, we can help improve the adherence grade. After all, when it comes to safe medication use, anything less than an “A” is unacceptable. Hoey is CEO of the National Community Pharmacists Association. The research referred to was commissioned by NCPA as part of the association’s Pharmacists Advancing Medication Adherence (PAMA) initiative, which is sponsored by Pfizer, Merck, and Cardinal Health Foundation.